Native Instruments today released Traktor Pro 2.10.1, a free update that extends control of the Stems format to all Traktor users. This Friday's freeware is Mixxx rated yet for all audiences, as Mixxx have released version 2.0 of their free advanced DJ software. Native Instruments announced that the new version of Traktor is now compatible with the new Stems audio files. The iOS and Android app for effect control in Traktor Pro, TKFX, has been updated to version 2. DJs using the Numark Mixtrack Pro 3 or Hercules DJControl Jogvision MIDI controllers can now download the free Serato DJ Intro v1.2.5 software. 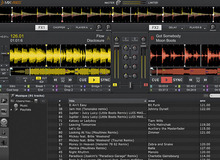 It only took Serato a few days to release a new update for its DJ mixing software, which is now in version 1.7.5. Serato added to its store five bundles for DJs and VJs featuring its software and effect packs, all available at interesting prices. Serato has also launched its Black Friday sale with a 30% discount off its Serato DJ and Video software.